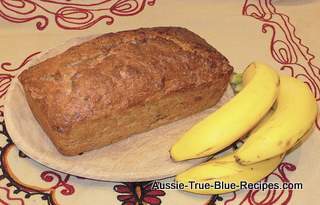 This simple banana loaf recipe is ideal for using up those bananas that have just turned a little bit soft, or are overripe. Cream butter and sugar, add egg, then bananas. Fold in flour and baking powder, lastly stir in milk. Bake in greased loaf tin for 45 minutes at 200°C. Ice with butter icing and chopped walnuts or serve sliced with butter.